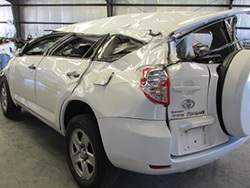 Pillars that support the roof of a car in the front, back, and sides are capable of keeping passengers safe when they are strong and resistant to the pressure and impact of rollover crashes. However, many vehicles have roof pillars which are lacking in the necessary strength to withstand rollover crashes, resulting in roof pillar failure – an event that can have serious consequences for the vehicle’s occupants. When one or more roof pillars on a vehicle fails to hold its integrity in a crash, all or part of the roof could crush those inside, potentially causing severe or fatal injuries. If you or someone you love was injured due to the failure of a roof pillar to hold in an accident, you may be able to seek financial compensation from the manufacturer of the vehicle. For more information about your legal options, speak to the rollover lawyers of the Willis Law Firm by calling 800-883-9858. The NHTSA has standards for roof pillar reliability, but the standards do not apply to larger vehicles weighing over 6,000 pounds, though these vehicles are generally more likely to rollover. If you or someone you love was injured in an accident wherein the roof supports failed to prevent a crushing of the roof, the Willis Law Firm can help you understand what your legal rights are and whether you may be eligible to seek financial compensation from those responsible. For a free consultation, contact us today at 800-883-9858.